I received the ARC from Bloomsbury. Seventh grader Gianna Zales loves art and running, especially cross-country. However, she’s not so good at deadlines, and her spot at cross-country sectionals is in jeopardy: if she doesn’t get her science project — collecting and cataloging 25 different leaves — completed and in on time, then her spot is going to go to arrogant, popular Bianca. Which Gianna doesn’t like, because in her own words: sparkly girls don’t run. Runners do. Over the course of a week, her best friend Zig tries to keep her focused and spending time searching for leaves, except it’s not as easy as it sounds. A funny thing called life keeps getting in the way, whether it’s her father’s job — he runs a mortuary — or her beloved Nonna’s increasingly alarming inability to remember things, or her mother’s rising stress level and denial about Nonna’s problems. 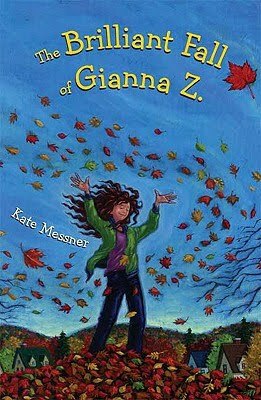 It’s a quiet book, funny at times, as Gianna struggles to not only complete her leaf project in time but to deal with the impending change with Nonna. What Messner does best with the book is give a sense of place: the sights, sounds, smells and feel of a Vermont fall literally popped off the page. Messner also helps by intertwining Robert Frost poems amid the science and running: it broadens the scope of the book and grounds it in ways that it wouldn’t be without the poetry connection. The only real complaint is the stereotypical plot: Gianna is neither popular or unpopular, in spite of her running prowess, and has to waffle between being friends or not with the two outcast girls, Ellen and Ruby; the friendship-but-is-there-more with Zig; the overbearing and irritating mom; the popular versus nerdy conflict with Bianca (two guesses who gets to go to sectionals; it’s not difficult to figure out). Still, even though it was pretty predictable, it is an enjoyable read. Enough so, that I’m looking forward to what Messner has to offer in the future. I have a vauge fondness for books that include the desperate last minute gathering of nature collections! (There's a nice one in one of the Betsy-Tacy high school books, for instance) This sounds like a good representative, and I'll look for it (eventually).